Ken Macklin, the artist behind the cover art for Maniac Mansion was asked by Lucas Asterlund to share the story of how the cover came about. At the time Lucas was making a coffee table book about classic game covers, the book project was ultimately cancelled. 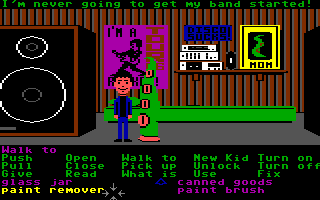 Maniac Mansion was released on October 5, 1987 for the Commodore 64 and soon after for the Apple II. But now lets hear what Ken had to say about the cover. Ken: I had a message forwarded to me by the Thimbleweed team that you were trying to contact me. Reply with any questions you have. I´m currently putting together a book/coffee table book called “klassiska omslag”(Swedish for classic box art). The idea is to have one page with the box art and on the other page some information about it. So if you could tell me a little bit about the cover of maniac mansion i would really appreciate it. How many sketches did you do? Had you played the game before you made the painting? 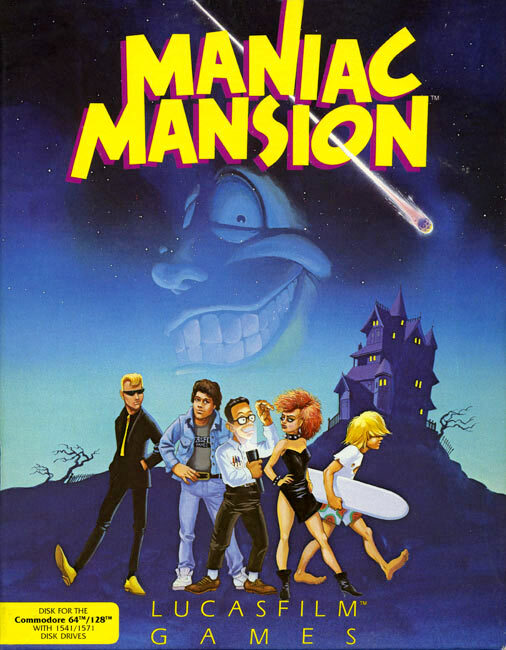 What are youre thoughts about the game Maniac Mansion? Was this youre first box art? Did you have any inspirations while doing the painting? And really anything you could share with me would be great. I was just beginning a career as a freelance artist/illustrator when I met Gary Winnick at comic-conventions in the late 70’s. We were both living in the San Francisco bay area and became good friends. In 1984 Gary got a job with the Lucasfilm games division and in 1985 Gary got me work as an independent contractor doing digital animation for games at the division which was then located at Skywalker Ranch in Marin County California. There were probably less than a dozen employees at the division when I started working there and Gary was the only full time artist. I worked on a project basis and was there for an average of 12 weeks a year. I did other freelance work then as well. I was working in comics and sold art at science-fiction conventions. My first game box cover was for a game called The Eidolon, one of Lucasfilm’s first games. I also had done a box cover for a game called Temple of Apshai for Epyx games. When Gary and Ron Gilbert began developing Maniac Mansion I knew all about it because I saw Gary frequently though I was working on other games and projects at the time. I had seen his sketches and many screenshots for about a year before he asked me to do the cover which was later in the development. I can’t remember if there was a playable version of the game yet when we did the cover. I remember test sequences and walkthroughs. I had not played the game. Gary had some ideas and provided me with character sketches. I remember we were looking at movie posters we liked at the time for inspiration. I did several roughs but we hit on the composition we liked pretty quickly. I was working in acrylic and gouache on illustration board then and all my illustration was done in my small bedroom home studio. The painting took about three days to complete, I remember Gary and Ron coming over to my house one night because Ron wanted to see the painting in progress. The original art was about 16X24 inches and remained property of Lucasfilm. I remember Gary and Ron doing a lot of long hours and hard work on that game for months and I’m glad they are still recognized for it. Feel free to ask if there’s anything else you may want to know and good luck with your project.